Happy Saturday! Today I want to show you some amazing creme finishes! I love them all, but many I only got one good pic of (I should not wait and edit in batches, I know I know! But often times they look fine in the screen on my camera! )…some more than 1, but I just decided to give a big spammy lovefest to some cremes. butter LONDON: Slapper. A gorg bright teal creme. Buttery (pun intended) formula, 2 coats. Ciaté: Cabaret. A stunning muted grape. I know, I know, I am supposed to hate this brand because of the whole Caviar/Fish Egg mani mess…the shades I own from Ciaté I bought before that mess, and I held off on wearing them…but I already paid for them, and damn if they are not heaven in a bottle. Sorry! Also, this is the base I used for yesterday’s Candeo Colors Orchid! China Glaze: Exotic Encounters. Another teal creme, but instead of being bold and bright like Slapper, it is muted and dusty. I loved it on, but OMG DID IT STAIN. The first time a CG stained me. wtf, China Glaze? :( This was also the base I used for Dollish Polish Random Dancing. Yummy shade but not sure if I will wear it again due to staining. What can I say? These are all beauties! Do you own any of these? What are YOUR favourite cremes? Fave type of finish. Great post Darling! Thank you! :) As much as I love my glitter, a great creme is just breathtaking. Isn’t it a great shade!!!! I’m loving this post. Cremes are my all time favorite and these are all so gorgeous! Thank you! I really do love a buttery creme! Do you have Fly from OPI’s Nicki Minaj collection? The BL teal is gorgeous but I feel like it’s a dupe… I’m going to Sephora today and want to pick it up if you say they are different enough, haha. I think I do have Fly…let me go look and I’ll compare it really quick! Ok, just holding them together (I was getting ready to do my nails, so was right next to my stash! ), they are close, but definitely not dupes. Just in the bottle, bL is visibly more green. These are all gorgeous colors. I really like the BL and CG ones! I just wish the CG didn’t stain! Slapper and Moust are two of my all time faves! I also had the staining problem with Exotic Encounters. What is with that one? How weird that the CG stained on you, I didn’t have any issues with mine. Such a shame when you have to avoid a polish because it wrecks your nails (*ahem* OPI Ogre The Top Blue, which gave me the worst stains EVER!) I have Slapper coming in the mail–can’t wait! Blues do again on me a lot, sadly..maybe the CG had more blue in it than it appears? I bet Amanda is drooling.. oh wait.. she likes glitter now! Ooooo cremes! Always love them :) They all look yummy, but I’d have to say Slapper is my fave mostly because of the name. Haha! 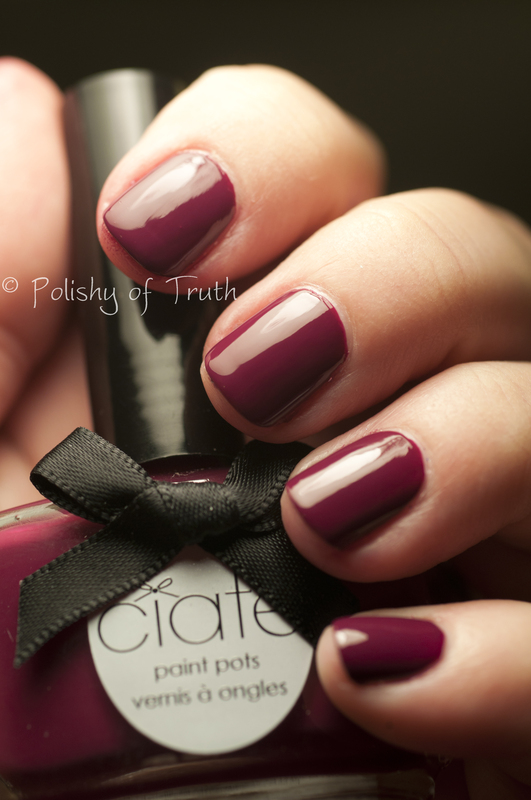 Yes it’s a great name, and a surprisingly lovely shade! Cremes with no glitter?? Color me surprised! But I loooove this post! Slapper is so awesome and that Ciate looks like butter (although, after the whole fish egg thing, I’m really turned off by them as well). You seriously rock the cremes, girly! It is soooo much prettier than I was expecting! Now I want Slapper even more. I can’t get enough of creme polishes! Me too! As much as I love glitter…when a creme is done right…wowza. Aww, really? That is sad news. I love that one so much.